[BSERV-2469] Include Mercurial (Hg) support - Create and track feature requests for Atlassian products. As a DVCS user, I would like to take advantage of Bitbucket Server to manage my Mercurial repositories as well as my Git repositories. Firstly, thanks for your feedback, passion and advocacy for this suggestion. Please accept my apologies for allowing this issue to remain open for some time without clear direction from Atlassian. 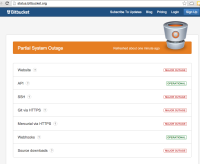 We would love to support the availability of choices when it comes to DVCS-based development in Bitbucket Server. However, we have decided that the engineering cost of adding and maintaining Mercurial support is ultimately the wrong direction to take the product. While it is heartening to see recent developments in Mercurial as an SCM, we have not seen signs of a positive market shift that would justify an investment for Bitbucket Server, especially given strong demand from existing customers for more capabilities based on Git. A number of people have offered approaches to make this suggestion a reality for Bitbucket Server, and we've explored and discussed them all. Ultimately, we feel that any commitment to Mercurial would need to be a full commitment; anything else defers future disappointment, as a second-class solution leads to frustration and regret. While Bitbucket Server and Bitbucket Cloud offer the same primary code collaboration features, they do have different origins, allowing them to optimize for the needs of their subtly different customer bases. Bitbucket Cloud has a strong foundation as a Mercurial hosting product and has a loyal following that it will continue to support while also investing in a range of other improvements. I reiterate my past recommendations to consider Bitbucket Cloud for Mercurial hosting if the choice between DVCS options is what is most important to you. Thank you again for your long-standing interest and feedback on this issue. We're confident that the improvements we have planned for Git-based development in Bitbucket Server will unleash the greatest overall potential in software teams around the world, and we look forward to supporting you. If you have any questions or concerns feel free to contact me directly.